Team A recruited Ron Simasek from the Badlees to help with this shot. They were doing their photographic interpretation of a Badlees song, Angeline Is Coming Home. Good job I would say! One of the bonus items was to get animals spelled out as words. Team A did a great job with this, earning many extra points helping them to victory yet again. Here they just managed to capture a butterfly. 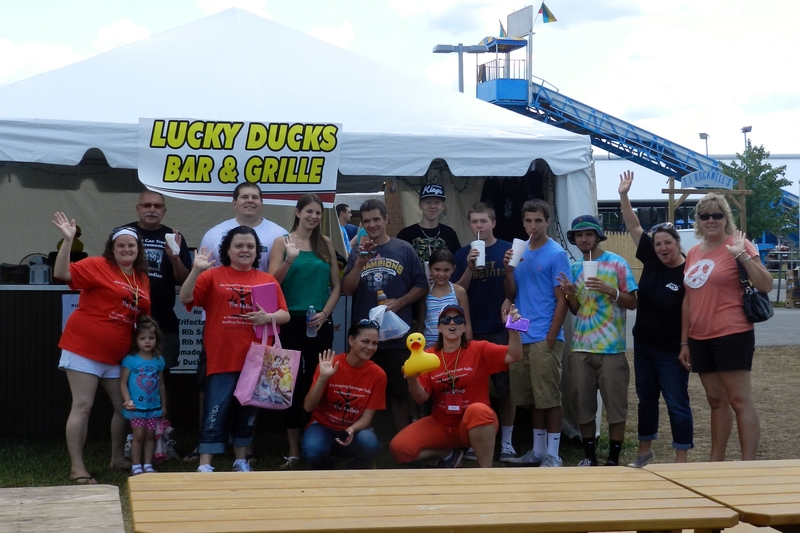 Lucky Ducks wasn’t a sponsor this year, but when I saw the giant rubber duckies I just had to send teams to their stand at the Etown Fair. Here Team Esthers Angels pose with many strangers, earning a whole bunch of bonus points. One of The List items was for the team to be ‘under arrest’, spread eagle against a wall. I love that Team Esthers Angels did it against the wall of the Etown Police building at the fair! More fun to come later! Team A recruits Pat Epler of Klip n Kurl Beauty Salon, one of our sponsors. 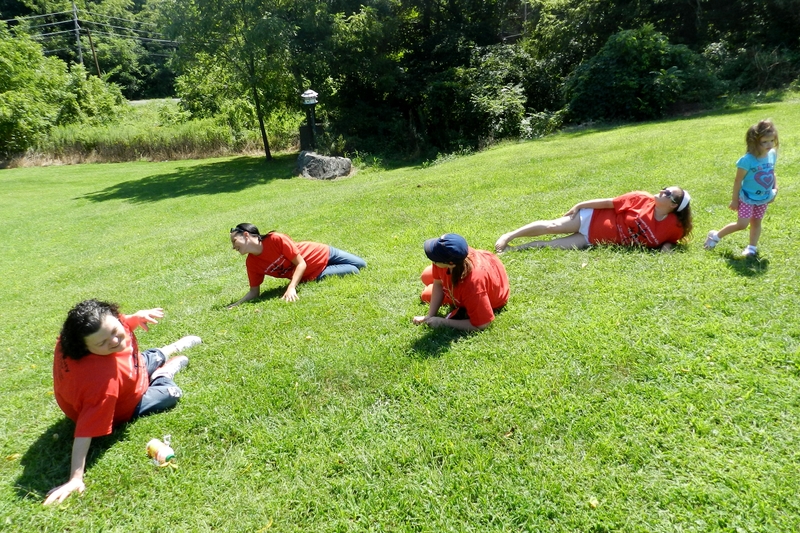 The team and Pat painted their toenails in matching colors. 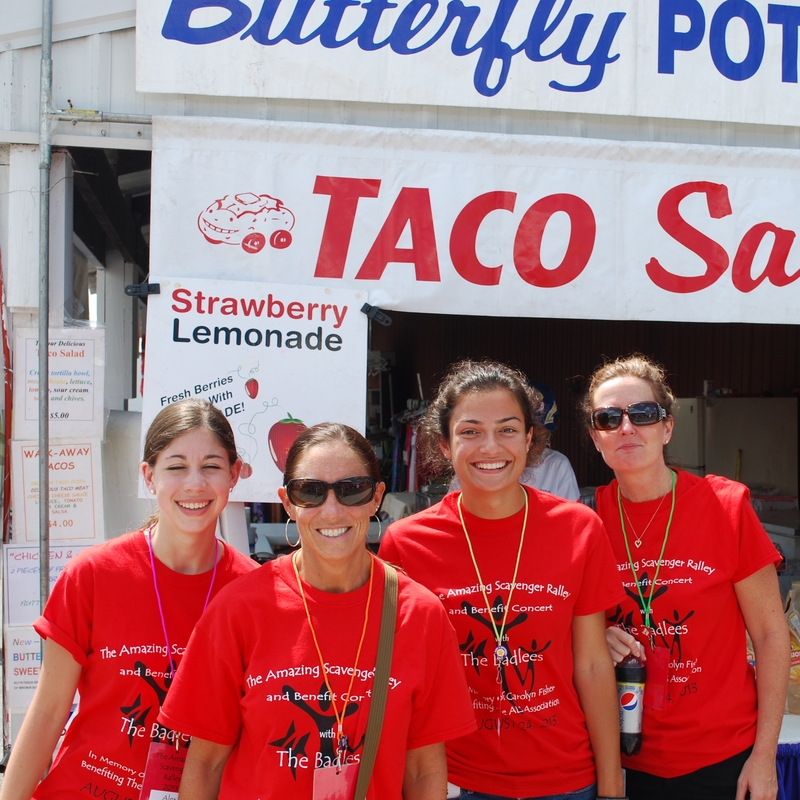 Here Team A enjoys an empanada with the stand owner at The Etown Fair. 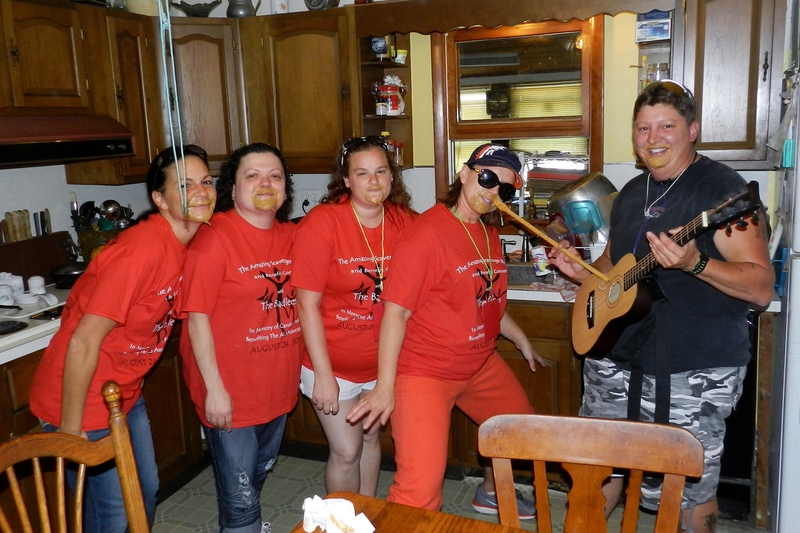 Team Esthers Angels with a variety of List items, including peanut butter goatees, a stranger picking a ream members nose with a back scratcher and someone playing a musical instrument. Meow, Team Esthers Angels basking in the sun like cats. More pics to come, so keep checking back! Once again, the winners are . . . Team A! Each year they have a different name, but each year Sue and Sammie are the winners! This year their teammates were Diane and Alex. Congratulations! Thanks to everyone who participated, I had a lot of fun thinking up wicked things for you to do. And from the pics you had fun doing them! I will get pictures up soon. Thanks also to everyone who came to the Badlees concert. It wasn’t near as many as I would have liked, but the Badlees were awesome, as usual. I will get a donation total posted as soon as I have it all sorted out. Good morning everyone! Thought I would throw in one last item before the fun begins. A picture of your youngest team member taking candy from a stranger. See you all by 9:30 at the latest at 2001 Fulling Mill Rd to start the madness! So I posed a hypothetical question to a participant in the Ralley and decided to make a bonus post of another item on The List. A picture of your ENTIRE team with matching nail polish on your toes, and we must see toes AND faces in the picture! And no, this can’t be done ahead of time, the nail polish will be provided at the location of the challenge. I hope no one just got a pedi! Yep, time is just flying and the are only 7 days until Ralley day. Just a quick post today with the item, more will probably come out next week, so stay tuned! A picture of a stranger as ‘a little teapot’. Pretty simple on this one, just need to find a stranger to play along! Hey everybody! This is Jen, blogging for Jana, since she can’t see right now. Wanted to give everyone their item to get ready ahead of time, and encourage you to find friends or family to sign up! Remember – it benefits a great organization – The Greater Philadelphia Chapter of The ALS Association. The more people we have, the more fun everyone will have! A picture of your ENTIRE team ‘fishing’ in a toilet. Bwahahahaha! I can’t wait to see pictures of this! Well, I missed last weeks post, sorry. I will add two items from The List to make up for it. Let’s start with this one . . .
A picture of your ENTIRE team holding up a train. And how about we share this one . . .
A picture of a chain of paper clips as long as Teammate is tall, with the Teammate in the picture. And of course, there will be more to these items, which you will find out about on Ralley day when you receive The List. In other news, I picked up the T shirts. They are great! Many thanks to Chris, the Badlees manager, for his continued assistance in helping make this event a success! The quantities of shirts for each size is limited, so to guarantee you get the sizes you require, register now and send me your sizes. I will not be ordering any more shirts unless we are almost totally out, we don’t want to get stuck with a lot of extra shirts. Or email me at badleesfan@aol.com. Thanks and see you in 3 weeks! Okay, only 5 weeks from today! I received the promo books, so if anyone wants to do some recruiting and fundraising in advance, I can give up a couple for you to use. Just let me know. This week has been super hot and humid, I hope this is the worst we will see this summer and Ralley day will once again be beautiful. So far our luck has been good and we have had blue skies, fluffy white clouds and reasonable temps. Now for The List item, I am sharing a bonus item that is making an encore appearance. 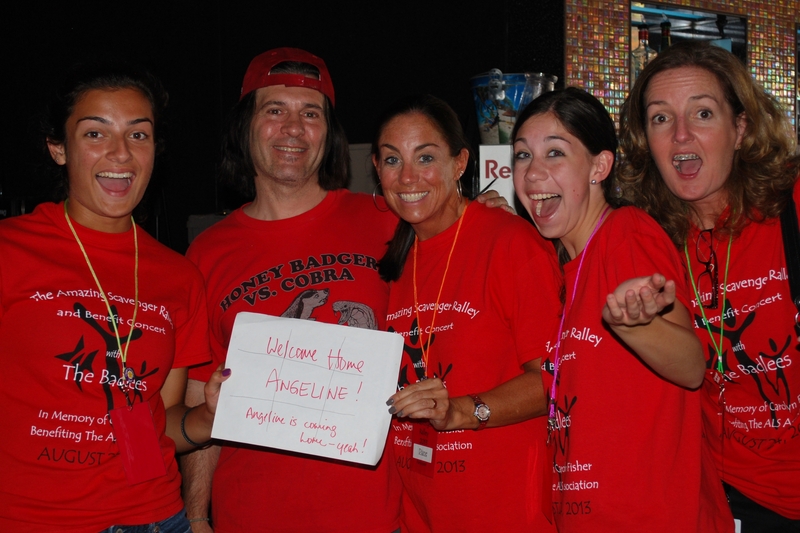 Last year it was also a bonus item, but only 1 team, Esther’s Angels, really took advantage of it. Below is a picture from last year and the item is . . .
A picture of your ENTIRE team with an animal spelled out in letters. 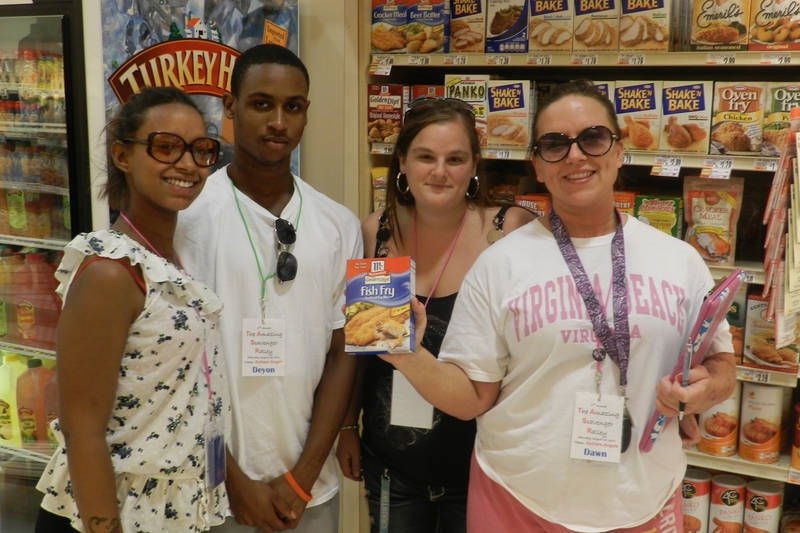 Here they are holding ‘Fish’ Fry. What we didn’t realize at the time was they should have gotten double points for this picture. In the background is ‘Turkey’ Hill. If you look around, you will be surprised by how many examples of this you can find. I thought I would try to do a weekly entry up until the Ralley. Keep in mind, I did say *try*, lol. The planning is going well. The t shirts should be here the beginning of August. I will be handing them out at the Ralley, but if you want them in advance to wash, we can work something out. In order to guarantee that you get the sizes you need, you need to register by August 7, at the latest. After that the printer can’t promise us to get them in time for the Ralley. Sizes available are adult only, Small to 4XL. Here is another list item for you to plan for. A picture of your ENTIRE team in the bleachers or seats of a football (or any sports) field. I hope you are keeping track of all these things, they are definitely going to be on the list. But there will be a little more to most of them, of course!